Donald Trump has received a “warm” letter from North Korean Leader Kim Jong-un about scheduling a second meeting, White House Press Secretary Sarah Sanders has confirmed, adding that conversations about a new summit are underway. “The primary purpose of the letter was to request and look to schedule another meeting with the president which we are open to and are already in the process of coordinating that,” Sanders said. The letter from Kim didn’t come as a surprise to the US president, who told reporters on Friday that a “personal letter is being delivered to me from Kim Jong-un,” adding that he expected it to be a “positive” one. “This is a big and very positive statement from North Korea. Thank you To Chairman Kim. We will both prove everyone wrong! There is nothing like good dialogue from two people that like each other! Much better than before I took office,” Trump tweeted on Sunday. 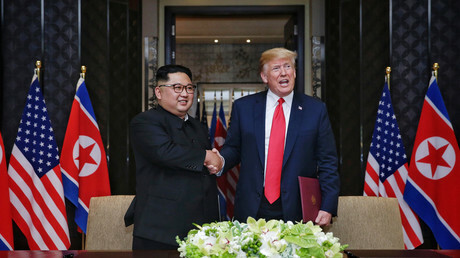 Trump and Kim held the first ever US-North Korean summit in Singapore in June, during which the two leaders broadly agreed to “work toward denuclearization” of the Korean Peninsula. Although Trump initially hailed the talks as positive and productive, North Korea accused the US weeks later of making “gangster-like” demands on denuclearization. Meanwhile, Kim has also received an important snail mail delivery, getting a letter from Russian President Vladimir Putin during a Russian delegation’s visit to Pyongyang. Kim now wishes to visit Russia soon, according to Russian Federation Council Speaker Valentina Matvienko, who said the time and date of such a meeting will be discussed.